The most important part of the race! Here is where there are the most trees—and the most leaves! There's the smell of bark and sod in the air, along with the buzzing of bees and twitter of birds. Such a lovely site... Ooops, don't get too caught up in the scenery now! Lampwick had narrowly avoided the hub-ub at the bridge- she considered herself lucky. She'd just had her fill of the crystalline pure cool water and was heading up the bank when ponies began falling into the water. Hornets began to fly, and what was once just a small crowd had turned into a furor of confusion and bustle. Lampwick found this all interesting enough, but she certainly didn't want to find herself in the thick of it. Turning away from the throng of ponies laughing, cheering, and jeering, she focused along the trail before her. She'd thought she'd been in the forest before- but had come to realize that the forest was much more thick with the golden and molten hues of fall than any landmark previously before. The trail was littered entirely with the colors of the sunrise and the sunset, and she could barely make out where there was trail, or simply forest floor. As if responding to her in like fashion- the forest erupted with sound as a sudden gust and breeze passed through the uncountable number of leaves still clinging to the trees. For all that had already fallen- many many more needed the encouragement of the stampeding ponies to bring them down. Lampwick had lost the commotion of the world around her, caught up in her new momentary fascination with the forest. For a long moment she just watched the forest- drinking it in slowly, just as she had the water from the creek before, but this drink filled up a cup deep inside her- a place in her that yearned for wonder, mystery, and beauty; and here in this moment, she had found it. A smile spread slowly across her muzzle. Feeling a part of the forest for that brief, private moment, she reared up onto her back two hooves, held her stance for a moment as her weight shifted- then like a pendulum in swing from one extreme to the other, she brought her weight and force down, smacking the ground with all the force her body and hooves could muster. For what seemed like a long moment she waited, searching the trees with her eyes. A few sparse leaves broke away from the maze of color that enveloped the canopy above her, swaying in the calm air as they made their way to settle upon the path. Feeling mildly dissappointed from the lack of reception, Lampwick looked back up at the leaves of the trees expectantly. It was then that a griffon blew past her at break-neck pace; followed by a brown pony, the skye-blue pony from earlier, and suddenly many many more. The force of the building stampede as it unwound from the bottle-neck of the bridge grew quickly; and as the earth trembled with the collection of hooves the leaves all around Lampwick began to fall- not just a few here or there, but hundreds- thousands even- maybe even hundreds of thousands! 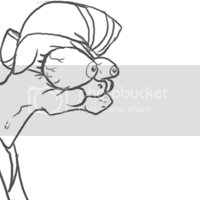 Lampwick's eyes grew and her expression lit up- now that was like the stories her Pah used to tell! The sight was breathtaking. Without loosing another beat of her sped-up and excited heart, she reared, gave a loud whinny, and was off to stampede with the others through the heart of Whitetail Wood! Zephyr continued his quick flying escape from the angry hornets. They zipped through the air toward their target who upset them and didn't let up. Zephyr knew he had to find somewhere to hide from his aggressors... AH! There was a spot to the side with high soft brush, full of flowers. Zephyr arc'd to the side of the path, the bees still giving pursuit. He jumped in, scattering birds, and tried to stay out of sight. The flowers, he hoped, would also mask his scent. Did bees smell, he thought? To his delight, the bees passed right by. Zephyr waited, a bit frightened, he didn't want to get swarmed. He was breathing hard and was out of breath. All the running and then speed flying wore him out. He hadn't taken a break at all the entire race other than the small moment he had fallen into the river. With the bees gone and Zephyr satisfied that they had lost sight of him, he got up and trotted back out to the road where the race was going on. Ready to start running again, he waited and decided to lay down a moment to take a break. He was tired. As he waited to the side, he watched a few ponies of all different colors run by. He really wanted to start up again, but he had worn himself out going so long and pushing so hard at that last moment with the bees. Zephyr decided to get up and walk along as he caught his breath. Looking around, he realized this area was beautiful. The smell, the sound, and oh the sight, all of it together painted a nice scene. If there was any place to take it easy, this was the place. A few other ponies passed him by, some wondering why the green pegasus was simply walking. Unknown to him a few stray leaves were stuck to his back hinting at his actions a moment ago. Before anypony had arrived to the segment of the track he had engaged in an activity he had never been able to enjoy as a foal. Namely, leaping into a pile of leaves and thrashing about. It was amazing fun. He could understand why they did it. It was so soft and the colors were all around you. Just laying in the leaves was like swimming in a painting. He could have almost fallen asleep right there. Sometimes trying to keep up appearances was a pain. Wouldn't want to be seen doing something so foalish by potential customers. The moment he had heard ponies coming his way he flipped himself over and shook the leaves off of himself. Hopefully he would appear as a casual observer. There were so many ponies racing! He couldn't There had to be at least three dozen. There were even some non-ponies too. He spotted at least one griffin and one Diamond dog. Though neither he recognized. Maybe they were locals. He didn't see many familiar faces among the racers either. The only one he recognized at all was a blue hued pegasus trying to close the distance. "CAT NAPPER! HEY CAT!" he called out as he stumbled from his pile. He started running along the edge of the track trying to match her pace. She appeared to be running with a Crimson Unicorn. She seemed familiar somehow but he couldn't remember where he had seen her. "Cat! You look rough" he asked with concern, "What happened too you?" Pausing above Sweet Apple Acres, in about the area he took off from, Swift Breeze looked in the direction of the other racers. He could see the leaves in the woods starting to fall as the mob of ponies ran beneath. "Hm... I seem to have fallen far behind with my little detour," he mumbles to himself. "I suppose I shall have to make up lost ground." Pulling up and over, Swift pulls into a spiralling dive toward where he took off from. As he approached the ground, he pulled up gradually, getting lower and lower until he was close enough to the ground. He folded his poor wings up and dropped the last few inches to the ground and into a hard gallop. He was going fast enough that he wasn't really able to appreciate the scenery, but he could just imagine the dressing down he'd get when he returned if he came in at LAST place in a race. "Just think of it as more training. Gruelling... merciless training." Already he could see the brook and the bridge in the distance. Most of the ponies were already past, but there were a few that were still milling about. His eyes darted about. There was the brook he knew the bridge crossed, but he wasn't sure how deep it was at this distance. ...so that just left the bridge. He looked at the railings on each side thoughtfully. The ponies seemed to be trying to catch their breath for a moment. A plan started to form. Aiming for one of the sturdier looking ponies, he ran full tilt at them. At the last moment, Swift jumped hard. "Excuse me, friend," he politely said to the pony in passing as he lightly put his forehooves on said pony's back. Swift Breeze's hind legs kept going up and over with the momentum of his jump. He pushed off of the pony's back to spring toward the railing. Looking at his hind hooves and the railing, he landed first with them. His ears registered a slightly concerning crack as he rolled the rest of the way to land with his forehooves. His hind hooves were already moving again, up close to where his forehooves were. Gathering his weight on his back hooves, he leapt off the railing and soared to the other side of the bridge, wings still closed. He fell back into a steady rhythm of galloping as he hit the dirt on the far bank of the brook. He could hear the angry shouts of the pony he'd used as a springboard behind him, already fading away behind him. "...I do hope that pony isn't too cross," he muses to himself as he runs. He wasn't quite sure what he would have done, had he not had his training. Already he could feel his body chastising him for being so rough with it. He would have to slow down sometime. "Perhaps I should have gotten some water while I was there." After her little mishap in the creek AND sleeping in to miss the first few legs of the race, Cat seemed to be making up for her slip ups by running at a steady, quick pace along the path. It felt better than the pegasus expected to be doing her part for Equestria, and she couldn't help but grin widely as the multicolored leave came tumbling down from the trees all around her. It truly was magical, even if there certainly wasn't any magic involved. The little pegasus slowed herself for a moment and smiled in greeting to the familiar rose-coated unicorn she'd befriended at the Gala. "Hiya Rose, wonderful to see you again!" She nodded and picked up her swift canter again, grinning and feeling even more confident about this traditional event now that she had a friend to chat with in the mean time. "How's Canterlot? And.. where's your brother? Bein' lazy, or just too chicken t'get out and race with us?" Cat chuckled softly, for a very brief second looking rather disappointed that neither of her dear friends had bothered to get out and run with her. Without Dark Core or Inkwell, poor Cat felt very out of place. Friends always made her more comfortable no matter the situation, and she brightened up immediately hearing another familiar voice call out to her. "Ashton, hi!" She greeted the unicorn enthusiastically and picked up her pace to keep up with him. Maybe running without her best friends wasn't so terrible after all, smiling softly to herself Cat found comfort in the thought that she had friends all around her everywhere she went. As Ashton asked about her rough condition, the filly finally seemed to notice the mud splattered over her pastel blue coat, now dried and caked in her thin coat thanks to the quick speed she'd kept up with. "Ah.. well, I had a little trouble getting over the creek. I'm all good now though!" She chuckled again, unafraid to laugh at her own clumsiness even though she was sure to develop a bit of bruising on her chin thanks to that fall. "So, how have you two been? Enjoyin' the beautiful fall weather?" On the surface, it looked like Mojo's racing strategy seemed to be working to perfection. He kept his rythemic trotting pace (except when he was rushing past those pesky hornets) and was staying in the back of the pack. Was this a brilliant tatical move, or would it assure a last place finished for the Paint stallion? Mojo didn't panic, the 'pony of peace' maintained his calm and cool demeanor. He was making friends and enjoying the scenary at each segment of the race. Shanna was still racing near him and race latecomers Estrella, Cat Napper and One Wing were nearly caught up to him. His new friend Lyra had zoomed far out in front and that crazy griffin who tried to fight a swarm of hornets was running just behind the leader Holly Dash. Now Big MacIntosh had pulled way ahead of him, but he could still spot Granny Smith fluttering above him and still holding a conversation. The Paint stallion was too worried to enjoy the spectatular beauty of the trees and falling leaves. Poor Appletini! Sure she was trying to surprise her big brother, but what if the tiny pony fell off his back? Mojo had glanced up at the right moment to see Saddlesore's rescue. He was happy that the blue pony was now safe and sound. For now, he continued galloping at his set stride, hoping there were no more surprises ahead. "Hay Shanna, did ya see that? Saddlesore got rescued! I think your brother was with me friends helpin'm with it! Good show!" The Paint pony was also pleased to see that Swift Breeze, the Pegasus who had left the race to heroically save Saddlesore from crashing, was near the front of the pack too. Even if he doesn't win the race, that pony certainly deserves a Good Sportshorseship prize! Mojo was happy to listen to the 'music' of the crunching leaves beneath his hooves and with his new friendship with Shanna. Back at the starting gate bleechers, Louise and Jubilee descended towards the place where Starflower and Misty Magic stood. Both unicorn fillies were well aware of the situation, thanks to the large shimmering portal that they (and a growing crowd of spectators) were using to watch all the racing action. "BRING SADDLESORE OVER HERE!" Starflower brayed, having prepared a makeshift cot for the blue stallion to lay in while she examined him. The two Pegasi gently lowered the still unconscious Saddlesore into the cot as the light blue unicorn nurse mare began to tend to her new patient. "Julibee, Louise, you two need to follow Granny Smith!" "Granny Smith? You mean the gray maned mare with the new wings?" Louise asked. "I think it's AWESOME that she can fly now! Maybe when all this is over I can teach her some of my best flying moves!" Jubilee shouted happily. "No no, you don't understand. Misty's unstable magic created those wings for her. They could vanish at any moment and if they do while she's still airborne..."
"Oh my goodness! That could be fatal!" "We're on it, C'mon Louise!" Jubilee neighed as she and her brown Pegasus mare friend flew off. Meanwhile, while still holding the blanket with the deactivated jet pack in it, Professor Krashkop smiled when he heard Hoss's words. "Danka! Und your parents are very nice ponies!" the hovering green Pegasus said before lowering his head in sadness. "All of dis is mein fault. I vas in such a rush to get dis jet pack finished dat I didn't do dee job right. I'm just a foolish old plug who should start acting his age." Misty looked startled at Snails who kept rambling on about her magic. All this 'hero worship' didn't set well with her. She'd been VERY lucky and she knew it. But still, this innocent looking unicorn foal wasn't going to listen to her explanations, she could sense that as well. She decided to play along with him, for now. "Sorry kid, I don't have any other magic tricks to show you at the moment, I would like a apple smoothie, if it isn't too much trouble." Above the racing trail, a still fluttering Granny Smith continued flying backwards so she could keep talking to Big Mac, Mobias and Shanna. "I've never felt better in my life, young filly! These here new wings are makin' me feel like a foal agin! Can't explain what the hay happened, but I'ma gonna enjoy this as long as I can! if this here's a dream, I don't wanna wake up!" The elderly Pegasus look another good look around. "I couldda swore that Applebloom ran off to join this here race, I might be wrong about that. And I have a feeling in my old bones that yur sister Applejack's nearby, but I don't see'r no wheres!" Survey, trying to follow Klondike was being pushed and shoved the whole time, and in the end losing Klondike out of his sight. ''M-Mister Klondike!'' he yelled, hoping to hear a reaction. He sighed, as he tried to make his way through the horde of ponies. ''O-oh, g-great job, Survey..'' he said to himself, slightly loud. ''Y-you meet s-somepony and you a-already l-lose him out o-of you're s-sight..'' he said, facehoofing. ''I w-wonder w-where M-Mobius is..'' he said, speeding up. He became distracted by the lovely landscape. He was perplexed by the beauty of nature. He stared at it for some time, smiling at it. He did get out alot, however never had time to actually to enjoy some of those moment. He shrugged and stood still, getting to the side of the road, and looking trough the forest, smiling warmly. He ignores the race for a moment, trying to hear every little thing coming from the forest. He sighed, and shook his head. ''I-it's so.. p-peacefull..'' he said, enjoying the view of the forest. He sat on the ground, drying mud crumbling, as rummaged around in his bags, looking for the water bottle. He took a few sips, while Blacky sat down waiting aside him. As Seeker marvelled at the sight of the whirling leaves, several ponies ran past him, most of them not taking any notice of him. The dog looked up expectantly. "Yes, yes," mumbled Seeker, "one more minute." Lyra listened to the grey pony's complements with a smirk. Had her little trick really made that much of an impression? "It were nae magic? Amazing! It wasn't magic?? That's amazing! Ye must have incredible balance! Oi'd ken tae ye bein' a tumbler, or a dancer! As fer ‘bonnie,' it means umm... pretty, it means pretty!" The unicorn couldn't help but let out a giggle at his words. He was pretty funny in a way. "Oh, please, you're embarrassing me!" She said playfully, though truthfully the praise was nice. She noticed his blush and wondered if maybe he had a crush on her. No, that was a little much. He was just worn out from the race, that was all. "Aye, nice tae meet ye, then! Oi'm Carrot Fields!" "Well then Carrot Fields, let's get going!" She began to move back into the race, trotting slowly at first, before getting into a steady, mid-speed gait. She wanted to make sure that her little stunt hadn't cost her too much time. As the pair ran into the woods, Lyra let her gaze wander to the tree tops and the falling leaves. The oranges, yellows, reds and browns swirled around her as she ran, and the songs of the birds left her feeling calm and content. The chirping of the birds gave her a strange idea. "I wonder if I can..." she murmered to herself, barely aware of the other racers she was passing or being passed by. She let her eyes close for a moment as she called up one of her favourite spells, a magic sound spell. She wanted to try and see if she could mimic the birdsongs. Gently calling on her magic, she mentally shaped the soundwaves in her mind. The sound played, emmanating from her horn. "Oh dear, that's not right. I wanted birdsong. That was more like a whistle." She remembered that Carrot was still running with her and her face flushed with embarrassment. "I, uh. I like to test my magic by copying the sounds I hear." Lyra explained. "Of course it doesn't always work and- GAH!" Not paying attention to where she was going she ran straight into a huge pile of leave left of the ground by the thundering hooves of the other racers. Not only was she now blinded but she also got a mouthful of leaves. "Ack! Pffft! Pffft!" She spat, all the while still running. Only once she'd cleared the leaves from her face did she notice the huge tree in her path. Too late! Flattened out against the giant oak tree, Lyra's form slowly slipped down, her eyes spinning in her head and her tongue sticking out. Around her head, little yellow birds spun, chirping as they went. "Heeeey! That'sh more like it!" she said in her daze. Number 34, Klondike, had at some point managed to pull ahead towards the front portion of the herd. He had run past many ponies, including Big Mac with his tiny Applyjack jockey hallucination, but could still see plenty more ponies in front of him. Klondike hadn’t expected so many ponies to be competing and was uncertain of what spot he held thus far in the race. However, as he entered the next leg of the race and ran through it, there was one thing that he was certain of, it was the most beautiful thing he had seen since moving to Ponyville. Being a repair pony, although it had its advantages of never having to worry about a runny fridge or squeaky floor boards and leaky pipes, it had the disadvantage of keeping him indoors for major parts of the day, if not the whole day. And for Klondike, given his habit of getting lost in his work, this could easily translate to being indoors for days on end at a time. He had never really taken the time to fully admire the nature that surrounded Ponyville, and now that he was running in it, it was simply breath taking. “Sweet Celestia…” Was all that he could say as he took his eyes off the road in front of him and looked at the scenery above him, eyes as big as saucers and filled with wonder and disbelief. Above him was a vibrant sea of reds, browns, oranges, and yellowish gold leaves. Not just hanging on the branches of the trees, but floating in the air itself. The thundering of the herd’s combined hooves could be felt well before the herd itself could be seen, and had been enough to begin shaking the leaves off of the trees well ahead of the leading pony. The leaves were raining down over the runners so thickly it was enough to momentarily block out the rays of the sun and cause them to shine through the leaves themselves, making the vibrant display of colors overhead the ever so more beautiful. Klondike was transfixed on the sight above, the race for all intended purposes appearing to have vanished from his thoughts. As far as he could tell, he was no longer running in a race, but through a sea of colors and lights. And, with a smile on face and wonderment in his eyes, he did the only thing that he could as it pop into his mind. Not noticing a sudden turn in the path because of his sightseeing, poor Klondike ran straight into a tree, the force of the impact flinging him off to the side and into a bush. The poor tree suddenly lost all its leaves as well from the impact, while the equally poor bush now had a pair of hooves comically sticking out from it. The hooves were slightly twitching. It was all Klondike could muster as he lay on his back inside the bush. He was unhurt except for a few scrapes and a few bruises that would likely show up once he was home. If anything, Klondike was severely winded, so while laying inside the bush, he decided it was as best a time as any to take a 5 minute break. (OCC - I'm working all day so I figured I'd leave Klondike to his own devices for a while... Hmm, guess that was a bad idea." Upon entering the forest again, one-wing was awestruck by the gorgeous view of the forest, and the swirls of leaves as the ponies raced on the forests path. "wow, this place is.....wow...." he stood there in awe struck in a few moments, staring at the gorgeous forest, and hovering leaves. Then after a bit he quickly returned to reality. Still a bit wet from the incident at the bridge, he had turned it up a notch. with his cramp being gone he was able to run without much of a sting. He gently took a look around, looking at all of the various colored leaves, the nice bark of the trees, the mountains in the far distance and the sun glimmering through the leaves. giving a distinctive shine. up ahead he heard several ponies charging and talking, but he didn't want to rush it, yet. as such a beautiful scene deserves many eyes to be looked upon. when in the woods something caught his eyes. It was a small black cat, and it was eying him up. curious by this, one wing stopped and looked at the cat. "Huh, the cats staring at me." He stood, staring back at the black cat which let another meow. slowly he began approaching it, and lowered his head to look it in the eyes. "Why, hello there cat. Why are you watching me?" he smiled jokingly, thinking it wouldn't respond to his query. when the cat pounced up on his head, bit into the fish and then ran off onto the racing path. "...i had a fish on my head? well that must have be-...WAIT! CAT GET BACK! DON'T GO ON THE PATH!!!" One-wing quickly sprinted out to the the cat on the path, looking to his left to see any oncoming ponies. A few of them were well on there way. One-wing hesitated and pounced after the cat, picking it up by its neck, and quickly jumped back into the forest as the ponies placed behind him raced by. Putting the cat down, it ran off quickly as he sighed to himself. "Now I'm behind ain't i...oh well at least the cat didn't get hurt." he looked about and began running again, when around a turn in the path there was a large cloud of leaves, in shock he jumped to the side to avoid it, but fell over a low hanging branch and crashed his face into a flat faced rock. "ow...."
He got up once again after getting over the shock and pain from the impact, and slowly began trotting along the path, admiring the nature in his slightly fuzzy, dizzy state. "This place sure is smashing..."
A scattering of leaves fell across Shanna as she trotted along, eager to race the bold dreadlocked pony. Before Shanna races ahead, Mojo calls out to her that Saddlesore was rescued. "Is that who that was? I'll have to ask Hoss about it.. No, he'll be telling me all about it for a week if he had a hoof in the rescue..."
She smiled at Mojo "I'll catch back up with you soon, or the other way around. I'll keep pace with Big Mac and Breakah for a bit." She looks back between her wings for a moment "Shoot, still no sign of her on me, Mojo. I'll stay close to them in case Applejack needs a way out.."
As she speeds up alongside the dredlocked pony and Big Mac, Granny Smith zoomed over her and replied to her. She giggled "Well, be careful Granny Smith! The branches can catch you if you arent' careful." She shook her head, hoping it was just a bird. Several ponies were already running into trees, safely cushioned by mounds of leaves, and she didnt' want to do join them. "Eyes forward Shanna, and race!" However, her gaze did keep sneaking over to see how she was doing against the big, exotic pony, and back to Big Mac to see how Apple..tini was doing..
Far above, Hoss moved to comfort the elderly stallion. "Oh no Professor, You are doing wonderful things, as amazing as the unicorns of Canterlot. After seeing the things the griffons are building, I think the ponies you inspire are going to be the ones to keep Equestria on a par with the griffons." He pulled up a cloud "I dont know about you, but I think we both need a rest. Lets watch the race until the girls come back. Here, let me hold that for you." He gasped as he looked down to see Klondike ram a tree and get covered in leaves. the stallion seemed okay if stunned. "There's that repair shopkeeper! I think we'd better keep an eye on him. If he's not up in a few minutes, I'll go check on him." As he watched, he saw a little yellow steak zip from place to place just off the path "How is she doing that without wings?" Madam Bistro trotted over to Starflower as she tended Saddlesore "Is there anything I can do to help?" She ulped when the unicorn sent the pegasi mares back out to watch Granny Smith "Oh my! I hope they keep close to her..."
Bramble was haring through the forest crazily, racing at breakneck speeds, outpacing most of the other ponies easily as he tried to get away from the sudden swarm of hornets. He went over hill, through bushes, the leaves showering over him and sticking to the mud still covering his head. Down into a valley, up another hill, then he was running in mid-air, just off the edge of a cliff, as the hornets kept going, not noticing the pony they were chasing had suddenly stopped. Bramble dropped, as he realized what was going on, dropping into the mud at the base of the cliff with a great splash. He groaned, and drew himself up out of the thick mud, giving himself a little shake that totally failed to bring him back to his normal pale lavender instead of being covered in thick, dark brown muck. Bramble froze, looked down at the mud pit, from which several long, sinuous snakes were emerging. "AAUUUUUUUUUGH!" Bramble cried, "SNAAAAAAAKES!" He raced away from the serpents, once again at top speed, racing right past a batch of racing ponies and plunging into the forest once again, the leaves falling from the leaves further coating him in oranges, reds, and yellows, sticking to the thick mud and transforming the delicate little unicorn into some sort of running pile of leaves. He hauled back, screeching to a stop, leaving furrows in the soil as he came to rest just *barely* short of a patch of blue-leaved flowers. He glanced around, quivering, and realized the snakes had never chased him... he let out a soft sigh of relief. A spider emerged from the Poison Joke patch, the plants having magically enhanced its size so that it was almost as tall as Bramble himself. Bramble's eyes grew wide as saucers, then he turned to run once more, letting out a fearsome wail. Ponies on the path would see a pile of leaves letting out a fearsome noise go rushing over the path ahead of them, not even noticing them as it plunged into the forest on the far side once again. Bramble bounced off several trees, knocking off the massive mushroom growths, which fell down, sticky with tree sap, to stick to his head... two large red and white mushroom caps falling down to cover his eyes. He bonked his head on a low-hanging branch, and staggered through the forest a bit more before emerging once more onto the path, unsteadily wobbling his way along it blindly as he let out a long, low groan of pain... nothing more than a creature of leaves, mud, and mushrooms, letting out a long, terrible moaning noise. He'd certainly outpaced every pony here... now if only he'd run even remotely *close* to the trail, instead of having zig-zagged every which way through the forest except where he was supposed to go! Carrot Fields started to feel more at ease - it would seem the turquoise unicorn filly, Lyra, seemed to like him a bit, despite his usual fumbling around fillies. Carrot ran a nice steady gait alongside and a little behind her, figuring it was polite to give her the lead role in their running, although the view was pretty nice too. By which, of course. he meant the large, dense forest! Nothing else, of course not! The leaves were at their peak colors, a canopy of various hues of red, orange, brown, and yellow made the scene a cornucopia of color and beauty. A fair amount of the leaves were already on the ground from the racers ahead of him, including that griffin he had seen fly across the bridge, a feat that still annoyed him; Carrot wanted to win, to impress his sister, Purple Haze, and perhaps some of the single fillies, but he wanted to do it without any tricks, without any cheating. Looking over to Lyra again, whose sweet little form, running through the swarm of gently falling leaves, really stood out among the warm colors. It was like a perfect, fancypants portrait, except in motion. Oi wonder if'n she's a local lass? Before he could ask, he noticed that her horn began to glow a soft, pale green color, building up some sort of magic that only unicorns could understand. Then it came, a very loud whistling sound emanated from her horn, but more like what a bird would make than a pony. He reared up in shock and surprise, landing stiff-legged on his forehooves. Carrot felt embarrassed, feeling like some sort of scaredy-foal reacting like that. He certainly didn't want to insult her by implying her magic was scary. Carrot just blushed, trying to find the words to make the best of the situation upon hearing her explanation, "Aye! Loik fine-tunin' a fancy instrument afore playin' a masterpiece!" Ach, Carrot, that dinnae make any sense! Ye should have compared her magic tae singin', nae an instrument! Why cannae ye 'er say th' right thing? Looking back up at her and her inevitable reaction, he saw she was galloping off-course through a dense swarm of leaves and right towards a tree! "Oye, look out Ly-!" Carrot flinched, squinching up, one leg lifting before him, watching in horror as she slammed right into the large oak tree before his warning was even finished. Quickly slamming to a halt, his hooves digging into the dirt for a few feet before stopping completely, he ran over to his dazed companion.. She was still conscious, good, good... but she definitely seemed to have knocked herself silly. Carrot took her forehoof in his as he checked her head with his other, brushing her mane up to see how injured she was. She didn't seem to have anything more than a big bump, but she was dazed and confused. "C'mon Miss Lyra, ye kin kip a bit on me back. Oi'm sure they have a medpony at th' finish line!" He slid himself under her and lifted himself up so she could lay comfortably across his back. She was a little heavy, but nothing a good ol' farmer pony couldn't handle any given day! Carrot began to careful canter, wanting to keep her ride smooth as possible. The race was entering its fourth leg. They were deep in the woods now. The trees were thick all around the runners and countless leaves already rest on the ground, even before the runners passed. It was a picturesque scene of natural beauty. A certain griffin wasn't even close to noticing any of it. While, she supposed there was more to it than that. She figured the race was about at its halfway point. They still had a lot left. Gilda was only behind a single pony at this point, but that didn't mean some of the dweebs wouldn't pass her if she wasn't careful. No. It was about time she started sabotaging the competition. Anything to insure her victory, after all. Besides, it would be fun crushing these lame little ponies dreams of victory. She smirked as she decided to do just that. The mischievous griffin slowed down just enough. Finding a good spot, she used her powerful hind legs to kick up lots of loose dirt and leaves into the faces of some of the ponies behind her. That would surely screw up their progress, she thought while trying to aim for the ponies faces. If she could obscure their vision, that would be the best. When she was satisfied with that, she started running again. Finding the nearest competitor, she rushed him forcefully until they were astride one another. She then used her leg to kick at this pony's feet, tripping him up. With little effort from Gilda, the pony stumbled and fell back into the crowd. "Oops! Sorry about that!" Gilda called back sarcastically while smiling. "I should really watch my footing..."
The griffin laughed evilly as she began to look for the next great opportunity to trip some lame pony up. This pony race was turning out to be lots of fun. The sweet taste of victory was just becoming more clear with each passing leg of the race. Gilda would win this. There was no doubt. It would seem that they had caught up a little bit--Holly had pushed her brisk pace onto Stormsong, and had forced herself onward as well, increasing her pace every chance she got even the slightest downward slope beneath her feet, the gravitational pull pushing her pace faster. There was a couple times where she had pulled out past Stormsong in those moments when she let her feet fly down the hill, her tri-colored mane streaking colors behind her as the rolling hills that dove into the Whitetail Woods--where her home and garden were--a territory all too familiar to her. "WOOOOOOOHOO!" She cried out cheerfully, blazing past ponies in her rush of speed. She closed her eyes as the wind pressed into her eyes, knowing full well the turns of the path, as she had traveled it many times. In her rush, she took a moment to call back to her companion, "C'MON, STORM!!!" Before she knew what hit her, she was brought to a sudden halt as she slammed into a certain--not pony. As the dust settled, it became clear that it was NOT a pony that she had crashed into, but an all-too unhappy GRIFFON. She shook herself, and tried to handle this pleasantly, smiling, hoping that the griffon would take things lightly, "Sorry about that! Y'know how it is when you get those rushes of wind in your face--y'just can't stop!!" Completely unbeknownst to her, she had just done to the griffon what the griffon had just done to some poor pony--though she did it on accident. "Right-O, doll," Mojo said as Shanna decided to drop back towards the back of the pack. "Well now, there's the griffin who'd been fightin' those ruddy hornets! Think I'll trot on up and say HI!" Before he could race up to her, Gilda started kicking up dirt and leaves in his face. As she apologized, the Paint stallion could swear he held the griffin laughing. "HAY! That was uncalled for!" Mojo protested as he shook his head to ward off the shower of leaves and dirt shattered all over him. "Looks like she's not into fair play, well that's her loss!" the brown and white pony neighed as he continued to trot deeper through the woods. Mojo glanced around to see there were a few patches of poison joke along the trail. Nothing to worry about, he was smart enough to keep his distance from those plants. Up ahead on the trail, he saw what appeared to be a group of long, multi-colored sticks in the middle of the road. But as he got closer to them, he saw them move. "Snakes? Not to worry, seen all kind of those rascals back home on the family farm." As the agile Paint pony leaped over them and sped up to get away from them, he then saw a sight that made him gasp and attempt to come to a stop, his hooves sliding on the leaf covered ground. "Blimey! Is that a big spider? Me eyes must be playin' tricks on me!" he shouted before sliding into a huge silken web the enlarged spider had just spun. The hippie brony now found himself stuck to it, struggling to get free as the big spider slowly moved towards him on the web. "What a sticky wicket this is," Mojo said as he tried to think of a way out of this mess. "I didn't join in this bloomin' race to end up some giant spider's dinner." Hoss's words made the frustrated Professor feel somewhat better. "Danka Hoss, I vill try to do better in dee future!" the green Pegasus neighed as he flew back towards the starting line bleachers where nurse Starflower was still tending to a still unconscious Saddlesore. Hearing Madam Bistro's offer, the light blue unicorn turned to her and smiled. "When he wakes up, he'll probably be hungry. If you have some food available, I'll pay you for whatever he eats." Misty sat down on the bleachers, her mind very disturbed by all the events she had accidentally caused. True, everything seemed to turn out alright, but still, the yellow unicorn couldn't help but worry about all the miscast magic she'd been producing. Racing to catch up to the now Pegasus Granny Smith, Jubilee and Louise LaMare passed by and waved at Mojo while he was still galloping and BEFORE he ended up tangled in the huge spider's web. As they found the elderly flying mare, she was still hovering backward. Before they could confront her, they all heard someone shouting "SNAKES!!!!!" ahead of them. "SNAKES? Whar's they at? I know how to handle them critters!" Granny Smith neighed as she flew ahead where there was a group of snakes together. "HAY YOU SCALY CRITTERS! GIT A LOAD OF MY FAMOUS GRANNY STARE!!" Amazingly enough, the sight of Granny's stare shattered the snakes in all directions. The two Pegasi watching couldn't believe their eyes. "How did she do that?" Jubilee asked in shock. "That's astounding!" added Louise, "Hope she can teach me that stare. Could use it to scare off all the snakes back home in Appleoosa." Gilda was stunned to find that just as she was focusing in on the next pony to trip up, something suddenly collided with her and made her stumble. Gilda was shocked. Was this retribution? The pony she had tripped couldn't have caught up already? maybe it was one of the ones she had flung dirt at? She quickly tried to collect herself and see what had hit to her. To her shock, she saw her. It was the unicorn with the multicolored mane. It was the one pony that had consistently stayed ahead of her thus far. Her colorful mane hung there reminding Gilda of Rainbow Dash as the pony gave some cheerful no doubt false apology. Gilda knew what was up. This pony saw her strategy and decided the griffin was too smart. This pony wanted to take her toughest competition out of the race. "So, that's how you want to play then?" Gilda asked, smirking. "I know your game. You recognized me as a threat, huh? Now you want to trip me up." Gilda snarled angrily. "Well, I'm not going to let that just slide!" She then started to shout at the pony. "I've got my eyes on you! Believe me, if you try anything, you'll regret it..."
With that, Gilda, opened her wings and used them to push herself ahead with incredible speed. Having regained her momentum, she closed her wings and rejoined the race. She'd definitely be keeping an eye on that unicorn from then on. Estrella barreled down the path along with the other ponies, trying hard to resist the urge to gaze around at the scenery. Her mane and tail had a few fallen leaves tangled up inside of it but that was okay. She rounded a bend and gasped mid gallop, there were so many trees! Colors were raining down everywhere and she just couldn't help herself, once again losing herself amongst the beauty of the falling leaves and drifting away from the group of galloping ponies. Soon the black and white mare disappeared into the forest, maybe she was using a short cut...or something. It didn't take too long for her to be brought out of her daydreaming by the fact that trees now surrounded her, slowing down to a trot as she tried to get her bearings. "Well this is no good..." She mused aloud, trotting onwards through the woods, sooner or later she had to come to a path right? There was some yelling from her right and leaves began to move in eerie little patterns. Snakes zigzagged through the leaf covered ground, a small squeak coming from Estrella as she gave them a wide berth, leave them alone and they left you alone she'd been told. Once they had passed she went towards the direction of the yelling, trotting faster as the sound of pony voices reached her ears. 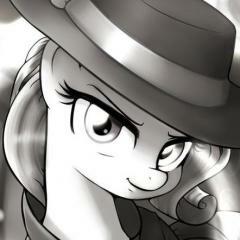 "Is anypony the..." The words died on her lips as her pupils shrank in terror. There in front of her was a giant pony sized SPIDER. She bit down on a squeal and tried to back peddle away from the arachnid, hooves kicking up a few leaves and making them rustle noisily about, the spider rounding on her suddenly and waving its forelegs about. She didn't know if it was harmless or if that was some sort of 'I'm gonna eat you' stance, but she bolted away from the nightmarish creature, screaming her lungs off as she imagined it chasing her. Survey ignores the race for a moment, trying to hear every little thing coming from the forest. He sighed, and shook his head. ''I-it's so.. p-peacefull..'' he said, enjoying the view of the forest. "HELP GIANT SPIDER!" She squealed, zigzagging through the trees to try and lose the predator that wasn't really after her, the spider skittering off to find somewhere less noisy. She passed by so many trees that they all began to blur together into a giant brown wall, panting for breath as she fled before breaking free of the trees and back onto the path. Huzzah! She made it back! Now if only that green...whatever it was would move out of the wa-CRASH! She barreled right into the other Unicorn, mistaking him for part of the woods in her panicked state, flopping upside down on the ground a few feet away, eyes swirling precariously she lay on the floor. Her ears flicked down as pounding hooves went past her, from her view point it looked like everypony was running upside down in the air. "Silly ponies...the ground is the other way." She giggled. The woods, perfect, this is the type of environment that Willow Wisp was use to. She spent much of her time out in Everfree and in the dark to boot. So a mid-day run through White tale wasn't going to be hard at all. In fact she could probably make up a little of her slow timing. Sure she didn't really care about coming in first, but it would be a bit embarrassing coming in dead last. So being one of the middle rung finishers would be good. Number 13 galloped along, staying on the path at first but as it seemed she was catching up to a group of ponies she decided to take another route. It wouldn't stray too far from the trail, but she veered off to the side, darting between the trees. It was just liking chasing wisps in the dark, bobbing and weaving with no trouble, even between trunks close together. "This is more like it, and no bridges." Wisp mused to herself as she breezed by a group of ponies not far off still running the path. "And it looks like I'm moving more into the pack." As she dashed through the forest her mind traveled back to her adventure in Appleloosa. It was like having to run through all those cacti. At least the trees couldn't sap her of her life, but the footwork was pretty much the same. Wisp's thoughts were disrupted. Getting lost in her mind distracted her from her task at hand and she slammed right into an oak. Shaking her head she stumbled for a moment, head just spinning. And after the stars had faded she looked around hurriedly, hoping no one saw before she took off again. The road to whitetail wood had been a smooth one - and Mac was feeling a mite bit more inclined to gallop faster...after all, he was making fair progress and they were mostly over halfway through the event. Sure, he wasn't really winning but...heck, he felt he was doing fine for where he was at. Still, he couldn't help but feel something was a little off...there was something ruffling around in his mane, and it was beginning to get a little irritating to the stallion - at least, it was distracting him just enough to start making him want to itch. Of course doing so would both he'd have to stop and do so, which he didn't particularly want to do. there was also the curious fact that he could practically swear he could smell applejack...there was virtually no mistaking the scent of his own sister, and the Stallion was all the more confused for that. It was even almost getting to the point where he thought he'd heard her voice a couple of times! Had Mac been paying more attention, he would have seen a quick glimpse of his younger sister, Apple Bloom, making a quick scuttle amongst the racers before disappearing from everyponies view - however, with his mind so full of questions and ponderings, he just wasn't in any frame of mind to pick her out of the crowd just yet. Despite all of these thoughts currently running through his mind, he kicked up a couple more gears, and sped up alongside the other ponies. The Farmer pony was more determined now than ever to catch up with those ahead of him...he'd lagged behind long enough! Clutch was starting to feel a bit tired as he ran past the trees that made what seemed to be the entrance of the woods. "I swear it's like it never ends!" he said to himself as he started to feel the effects of so much running in his legs, "I'm just hopin' that i've managed to get far enough through this thing..."
He looked at each of the trees that were standing tall as he ran past them, old and yet strong. The leaves on the trees fell as he past them, in shades of green, orange, brown and other coloring that were there. As the leaves fell, they caused the path to be covered with them, making it to where the path started to give a crunching sound with each passing step the Diamond Dog made. It was actually a pretty pleasant noise for him to hear, it being the first time in which he had ever heard of such a sound. He was able to run past a few Ponies through the next several minutes, most likely starting to feel the fatigue from all the running in which they did. "Gotta be more careful when ya run!" he jokingly sneered as he dashed past them. He was a pretty good sport sometimes, but he had a nasty habit of rubbing it in his opponent's face when he was doing well at whatever activity or event he was in. Cocky, thy name was Clutch. He panted a bit as he continued, feeling the strain on his legs and on his lungs amplify by a small amount as he continued on the path. He was indeed a bit tired, but unless he could catch up with the faster runners in the race, there wasn't much point at all in him trying to rest. He was determined to win no matter what happened, and if that meant no resting until the end, even if it'd likely be the end of him if he did, then that's exactly what he planned to do. Clutch was focused on the path, and the crunchy leaves that had fallen on it. Anything else, unless it affected the path or was another competitor, didn't matter, and such he ignored it. He was here to race, not see the sights, after all. Hopefully it wouldn't take too long to get through these woods, or else not even he could go onwards for that long. "Best be gittin y'self a move on, m'fren, or ye'll 'ave to make youself familiar wit' m'heels!" Breaker called back to Shanna, giving a playful little kick of his hind hooves as he pushed ahead, only to find her right back on pace with him a few moments later. He ran with his head high, breathing the cool fall air deeply, the forest around him taking up as much of his attention as the race. "Beeeyootiful," he said to himself, looking up at the trees overhead, following a few leaves with his eyes as they fell. It really was an incredible sight. The red, gold, and orange leaves pouring out of the dense treetops like rain, the earth and air vibrating with the pounding of hooves along the path. His sister was right, this was an incredible experience. The next time the ran into each other, he hoped to rope her into racing with him next year. The two of them side by side, galloping as hard and fast as their legs can carry them, just like when they were foals barreling around their island home. The memory of it warmed his heart and brought a genuine smile to his face. Breaker glanced over at the mare racing beside him, but it was the red stallion on the other side of her that caught his attention. "An' I thought I was de only one wit' de 'ight advantage, ah?" Breaker said, the mirth on his face fading as he saw... no, it couldn't be. A tiny pony? Hiding in the stallion's mane? He craned his neck for a closer look, complete confusion on his face. So intent on getting to the bottom of this little mystery, he didn't even notice his path veering toward Shanna, and it wasn't until he bumped right into her that his attention was broken away from the pint sized mystery hiding in the red stallion's mane. "Ah! Merrrrcy! I'nt even watchan me step, me," Breaker chuckled, blushing a bit and correcting his course. He shot the pegasus mare a sheepish grin. "Ah, hushame, miss, I'nt meanta doanny 'arm." As he entered the White Tail woods at a steady trot, Mobius took in his surroundings. The beautiful mixture of red, orange and yellow around him was absolutely stunning, and made the Pegasus a bit regretful about helping knock the gorgeous leaves to the ground. Ahead of him, the ground was already thickly blanketed with them, and as he passed along with other nearby ponies, yet more fell to the ground. Glancing behind him, he noticed that many of the trees further back were already completely bare, and sighed lightly before turning his attention forward. "Kind of a shame t' bring 'em down," he murmured before looking up at the trees once more, "Ah well. They grow back." A soft smile formed at the thought of how the woods would look once the first snows came, and then further ahead to spring, when renewed life returned to the countless trees in lush green form. Continuing down the track, he soon heard the faint echo of somepony's voice, the pale gold Pegasus squinting as he tried to make out what he heard. "Sakes...? Stakes?" he murmured before realization dawned on him. What else could it be in this crazy race? "Snakes," he muttered with a defeated sigh, shaking his head, "S'like this race was designed t' have dangers at every dang section." The Pegasus stallion shook his head of the thought, trying to regain his focus and, more importantly, his alertness. His eyes would dart from side to side, keeping an eye out for any of the scaly creatures for a good distance. Only a few dozen yards later, he finally saw one of the legless reptiles... and quickly noticed that it was slithering away at speed, seemingly running from something. Quirking a brow, he turned his attention ahead to try and see if whatever it was that scared the snakes off was still there. All he saw, though, was a group of Pegasi, including one extremely elderly looking one. "Huh... whatever it is, it musta left," he thought aloud. Before he could shrug off the thought, he heard a loud 'THWACK' as a nearby pony ran into an oak tree, causing him to wince as he slowed to a halt, his attention shifting in that direction. There, he spotted a black Unicorn mare with a bright blue mane and tail, who quickly looked around as though hoping nopony saw her crash before getting back onto her hooves and continuing on. Feeling a bit concerned, he began to gallop after her until he was next to her, at which point he would adjust his speed to match. "Hey, you okay? That was a pretty nasty crash back there," he began, hoping he had gotten the mare's attention, "Maybe ya should slow down for a lil' while? Still plenty'a race left, after all." Shanna was caught up in the moment, seeing clouds of leaves coming down, swirling around her almost like snow in flurries of red, orange, gold, and brown. Some of them were getting stuck in the mane of the tall stallion she was running beside. Shanna eeped and shook her head out of her revire as she heard Beach Breaker speak teasingly about showing her his heels. She giggled "Is that so? I'm no slouch at speed..." as she put a little more effort into it. She might pay for this in the last leg of the race, ...or sooner.. But she was used to long endurance hauls and was willing to bet she could make it. She giggled an blushed for a moment as he murmured "Beeeyootiful", before she realized he meant the leaves. "Y-yes, they go well with your mane an tail.." indicating the leaves on him with her nose. Shanna's attention was suddenly caught when she saw an earth pony, with a cutie mark of a carrot made of stars, carrying Mojo's new friend. "Lyra! Oh my! She must have hit a tree!" Suddenly, She was bumped by Beach Breaker, making her look down at the path for a moment as she skipped to keep from stumbling. Finally on an even keel, she looked over at him as he apologized. "It's all right. I had some close calls earlier myself." She neighed as Big Mac suddenly increased his speed "Wow! I didnt' think he could move like that!" as she sped up to keep pace with both stallions. Shanna nodded ahead at Lyra. "I hope I dont' end up needing carried like that. I'll ask to check her at the next rest stop. Mojo probably will too." Just then, Jubilee and Louise LaMare zipped up overhead to catch up with Granny Smith who was doing an amazing job for her first flight, and flying backwards to boot. Shanna looked up "Hay, hi girls! Do you know what happened to Granny Smith here?" Before they could answer, somepony ahead suddenly screamed "SNAKES! ", drawing away the flying pegasi. Granny Smith stopped flying ahead and did something with her face. Sunddenly, a nest of snakes boiled out of the brush heading in all directions, -including toward her!" Shanna yeeped and jumped over the snakes as they came at her. She shivered her bay hide. "Just snakes, just snakes, dont be afraid... Juuust snakes, EWWWWW!" Shaking her ribboned mane, she concentrated on looking ahead for the moment. In time to see Gilda kick leaves in Mojo's face. "Oooh! Did you both see that?! CHEAT!!" She was considering flying up and pointing her out to race announcers in the baloon ahead as Gilda was playing even dirtier, when a unicorn with a rainbow mane slammed into her. "WOO HOO! You go girl!!" She ahemed and looked to the stallion beside her "Sorry, I hate cheats..."
Shanna suddenly gasped and stumbled as she saw something like a pile of leaves with bright bug eyes shamble into the road ahead! She squealed and jumped straight up in the air. "OH CELESTIA! WHAT IS THAT?!" Fortunately for Mojo, Hoss was keeping an eye on Shanna and his friends since the Professor left. His attention was drawn by Miss LaMare and Jubilee zipping ahead and scattering snakes. watching the snakes led his eyes back to Mojo as he was struggling with.. "Oh Luna!" Grinning, Hoss rolled off the cloud and dove straight at the problem. The spider got closer, and closer, fangs agleam, when it was suddeny slammed down under the weight of the rocket pack. Hoss landed on top of the pack and looked down at the wiggling legs splayed out under him. "Hi Mojo!.. W-what?! ...Oh come on! That should have squished it!" He went into a fluttering hover and grabbed Mojo by the forehooves, and pulled hard, his wings buzzing like chainsaws. "Hurry! It's getting out from under that pack!" Suddenyl Mojo spang free, sending hoss flying away in a tumble through a patch of strange blue flowers. "AGH! OWWW My sore hoof!" Hoss sneezed a few times and hobbed out of the patch on three hooves, covered in crushed blue flowers. Something seemed strange about Hoss... Then Hoss spoke, in a very feminine voice... "Hurry Mojo!... I...uh, What's wrong with my voice?!" Madam Bistro nodded to "All right I have some hay rolls, oat cakes, muffins, and donuts. I'll go get them." Meanwhile, Snails returned with a smoothie, proudly trotting up to Misty "Here' ya go, Misty Magic! Nice an' cold! I... umm.. Are ya feeling okay, ma'am?"